- Entry to the Skydeck to view the awe inspiring view of Melbourne from the observation deck of the highest public vantage point in the Southern Hemisphere. - 5-6 minutes Edge experience. 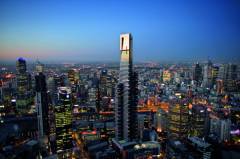 Eureka Skydeck 88 is located adjacent to the Yarra River in the heart of Southgate precinct. Boasting the highest public vantage point in the Southern Hemisphere, Eureka Skydeck 88 offers unparalleled views of Melbourne and sourrounding regions. Nothing you have ever experienced will prepare you for the awe inspiring views from the highest viewing platform in the Southern Hemisphere.Located in the CBD adjacent to the Yarra River at Southbank in Melbourne's iconic Eureka Tower, Skydeck will change the way you look at Melbourne and maybe the world. Eureka Skydeck 88 an experience above all else. Skydeck 88 operates from 10am to 10pm daily (last entry 9:30pm). Skydeck 88 is the only observation deck in the world that can thrill you with 'The EDGE'. Aglass cube which projects 3 metres out of the buliding, 285 metre up - with you in it! Child: 4-16 years inclusive - child rates apply.